Aug - 12 | By: Oregon Film | no comments. In Italy, the idea of American cinema is tightly connected with Hollywood and sensationalist movies where the hero is always handsome and honest and the audience knows that. By the end of the movie, he will defeat all his enemies who, of course, are ugly and bad. Why do Italians have this vision of American movies? Because, most of the American movies that arrive in Italy always have the same features: a big international secret, a woman in distress, and a hero that saves her. The ideas that Italians have about America; what it looks like and what its culture is like, mainly come from the movies. Arriving in America for my very first time, I realized that there is much more to America, and that there is also an entirely different kind of American cinema: the films that arrive in Italy just for film festivals. These films and are not widely appreciated by the public, even if they are acclaimed by the critics. I will take this opportunity to speak about American cinema from an Italian prospective, and try to understand the reason why some, maybe the best, American movies are never seen by the general public in Italy. A perfect example of this is Kelly Reichardt’s last movie: “Meek’s Cutoff.” This film was shot in Oregon and its premiere was at the Venice Film Festival in 2010. In fact, it was nominated for the Golden Lion award. Later, it was dubbed in Italian and shown in a few movie theatres around Italy. The Italian critics simply loved this western movie. Reichardt was able to reinvent the idea of the western genre, drawing from the reality of the long way through the high plains desert that the wagon teams used during the second half of the 1800s. The movie was shot in 4:3 and the Oregon desert seems an endless funnel that the audience is sucked into together with the characters. The space seems wide and endless, but watching it, everyone has the sensation of being trapped and can feel the horror of the early Oregon Trail’s travelers. 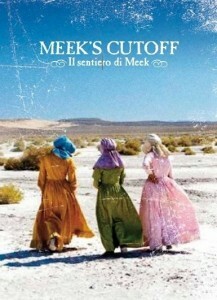 “Meek’s Cutoff” is totally different from the “western” films that Italy is used to: the so-called “spaghetti westerns” where gunshots and horse chases are the protagonists of the movies. During my time here I would like to explore the American cinema, especially the productions that have been shot in Oregon. My purpose will be to understand if these films are being relayed overseas and, if so, what the reaction of public and the critics has been.